In Part 2 of our blog series on MBSE for Autonomous Vehicles, we used a set of requirements based on DOT guidelines (“Automated Driving System 2.0: A Vision for Safety”, September 2017) and managed in a Jama Connect repository (Jama Software). 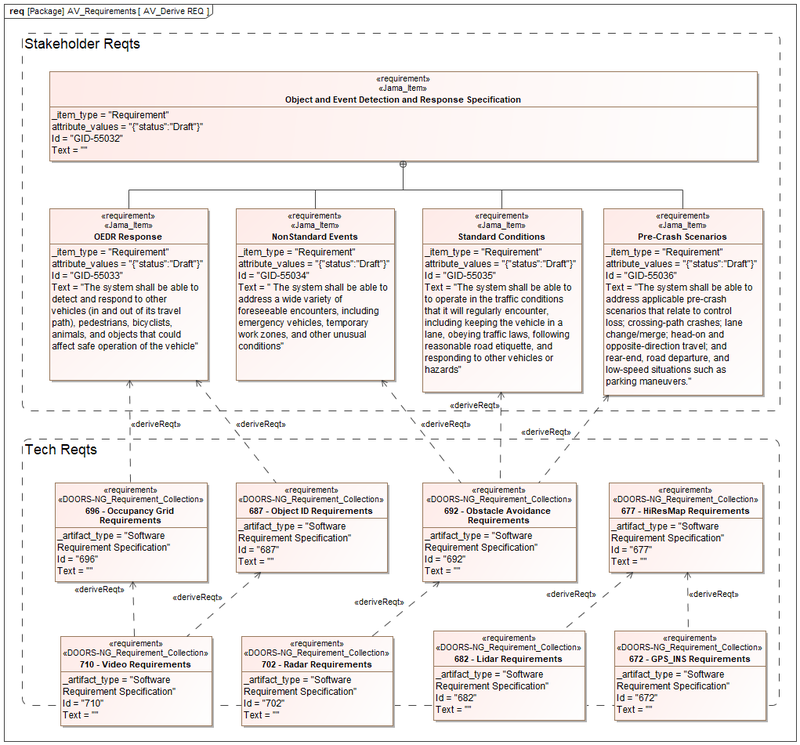 Using Syndeia, this requirements model was transformed into a SysML model with connections linking individual SysML and Jama requirements. 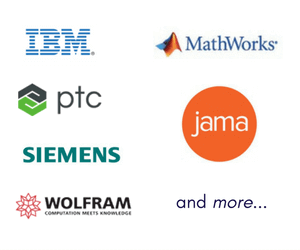 This enabled the SysML requirements to be compared and updated with respect to changes in the Jama master list, while also allowing them to connect to other SysML elements through <<satisfy>> relationships. On many occasions, project teams may use more than one requirement repository, reflecting different purposes or different organizations. In this post, we pick up the DOT guidelines as “Stakeholder Requirements and add a new set of “Technical Requirements”, which the engineering group is managing in DOORS NG. Again using Syndeia, we create a connected set of corresponding requirements in SysML, where we can establish traceability back to the stakeholders. Figure 1 shows the structure of this part of the Total System Model. Figure 2 shows some of these derivations in the SysML requirements diagram. Note that the upper-level elements, in the area labeled Stakeholder Reqts, have the stereotype <<Jama_Item>>. The lower level elements with the stereotype <<DOORS_NG_Requirement_Collection>>, are each sets of related requirements and derive from the elements above them. Within Tech Reqts, the first row represents some of the functional requirements, which will ultimately be satisfied by elements from the functional architecture. The bottom row represents hardware and software requirements, which will be satisfied by subsystems within the physical architecture. In Part 7 of this series, we will look at options for defining the functional architecture in SysML state machine and activity diagrams and linking these elements to GitHub for software development and JIRA for project management. The following posts will look at modeling and federating test plans, structure and simulation. The final part will demonstrate how graphs and pattern matching query languages provide efficient access to even very large system models. The SysML models in MagicDraw and IBM Rational Rhapsody will be made available for download with Part 10.